Like most foods, dairy has it's controversies. Is it good or bad? If you Google 'dairy and health' you will find thousands of articles supporting why it's good, and thousands supporting why it's bad. We grew up believing that milk is essential for bone health. Truth is, you don't need milk to be healthy nor to get these important nutrients that you would get from milk - calcium, potassium, and vitamin D. There are various reasons why one might omit dairy from their diet: being vegan, lactose-intolerant, paleo, casein sensitivity. Everyone has their own opinion on dairy, but my advice is: If you're going to have it, make sure it's good quality. Dairy isn't how it used to be anymore. It now comes packed with hormones and antibiotics. Reading the label is crucial when selecting dairy products. Learn what's in it and where it's coming from. Whatever it contains will be ingested into your body. I personally don't include dairy in my diet because I am lactose intolerant. I may have it every now and then (about once a month), and when I do, I choose organic and local goat or sheep as they are easier to digest. Aside from being a discomfort for those with lactose intolerance, dairy is acidic and can cause inflammation for anyone. This is why I suggest to consume in moderation, about 1-2 times per week, and get calcium from other nourishing and anti-inflammatory foods. Milk: coconut milk, almond milk, cashew milk, hemp milk, oat milk, flax milk - homemade milk is best to avoid preservatives and additives. Recipe for almond milk here. Ice cream: coconut ice cream, rice milk ice cream, blended frozen banana, thick smoothie. Try my vegan chocolate-coconut ice cream, it's delicious. One of my favorite dairy alternatives is cashew cream. It's simple to make and so delicious. Cashew cream can be used as a dip, spread, dressing, pasta sauce, pizza sauce/cheese, burger topping, and anything else you can think of. 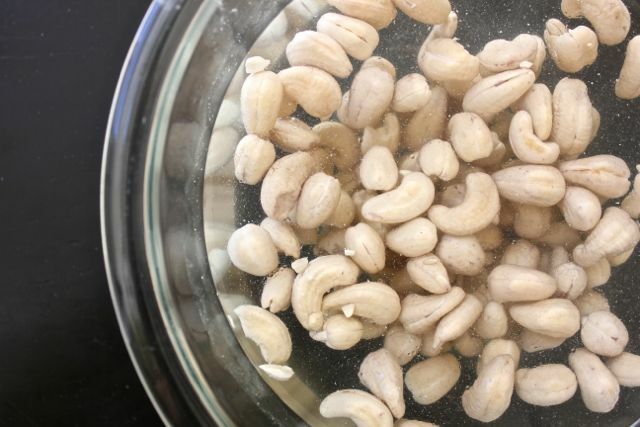 Soak cashews anywhere from 2-4 hours. Drain and rinse. Place in blender with the rest of the ingredients and blend until smooth. *The amount of water or broth you use will determine the consistency. Only use about 1/2 cup of water to get a more cheese-like consistency. Play around with liquid measurements and see what you like best. What's your favorite dairy alternative? Please share in the comment section below.